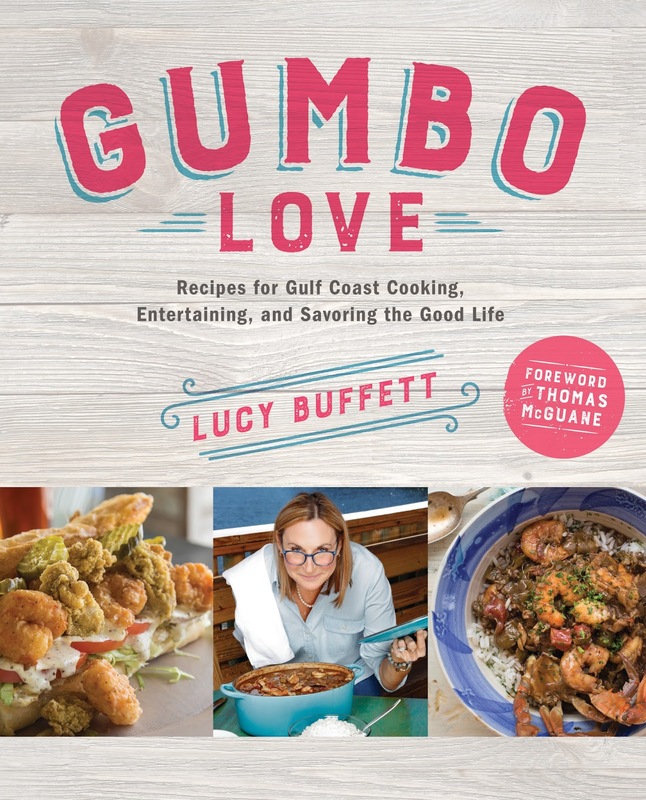 I was contacted by the publicity manager of Gumbo Love recently, and was asked if I would like to receive a copy of the cookbook to review. Y'all know me well enough by now to know that if it has anything to do with food, cooking or a cookbook, I am ALL in. 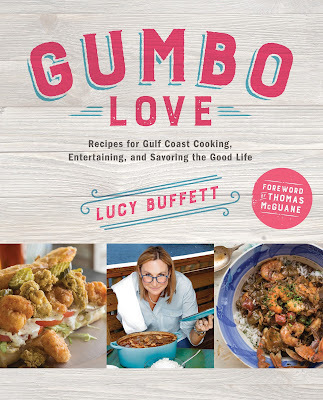 Add in the fact that the author is none other than Lucy Buffett, Jimmy Buffet's sister, and I was prepared for it to be 5 o'clock somewhere and ready to get cooking in the kitchen. Although I received a copy of the book for review, all opinions expressed are that of my own. I was immediately drawn in by the cover of this gorgeous cookbook. A brief description of the book. Moments spent at LuLu's keep me connected to where I came from. 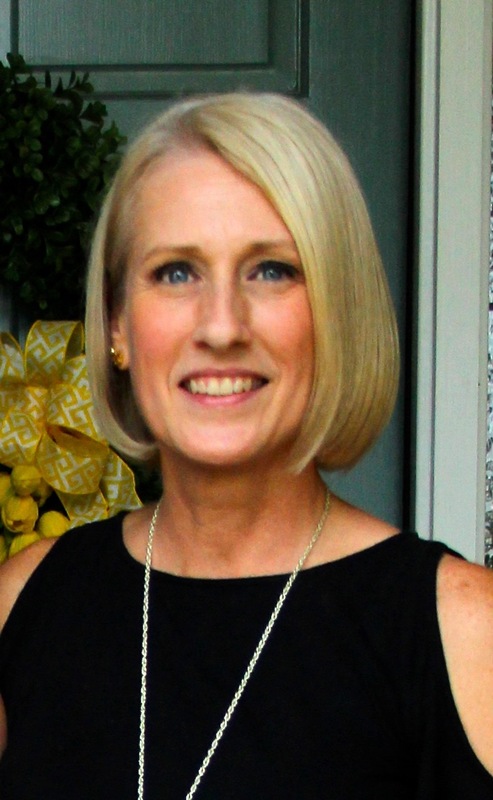 I can drop my anchor in a booth by the water and savor a bowl of gumbo; for me there is more than fresh crabmeat, oysters, okra, shrimp, and filé powder in that bowl. It contains the faces and memories of friends, family, and events that remind me of the child of the coast that I was and hope to always be. In this book, LuLu has gotten it all down on paper, with great recipes for food that comes with history. My #2 saw the cookbook sitting on the counter after it arrived and exclaimed, "I've eaten at her restaurant in Alabama" and just raved about the shrimp tacos! Turns out she and her girlfriends ate there while taking a break from grad school. Now she was ALL in too. I was given the recipe for a scrumptious Classic Southern Poundcake to share with my readers, but in the end due to our dietary restrictions we decided to make another scrumptious dish from the cookbook to share with you all. 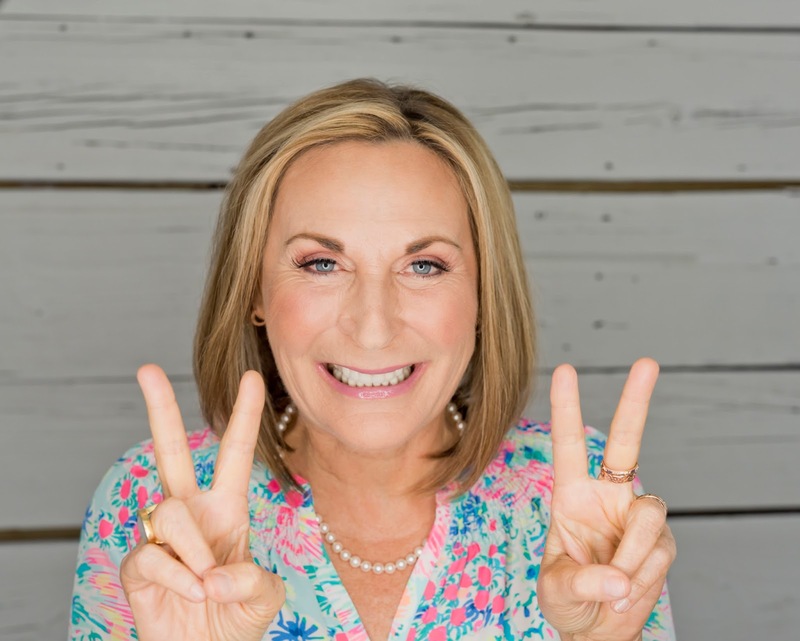 I know many shy away from cookbooks due to dietary restrictions, but as I have shown you all in the past and again with this recipe, most can be easily adapted to suit your needs. The only substitution we had to make was using vegan butter. Suggested sides: Cuban Yellow Rice (recipe available in the cookbook) or spinach. We chose spinach, as my #2 has a sensitivity to tumeric, commonly found in Spanish rice. 1. In a small stockpot, melt the butter over medium heat. Add the garlic, ginger, and jalapéno and cook until fragrant, about 2 minutes. 2. Stir in the curry paste and fish sauce. 3. Add the broth and coconut milk. Stir to combine and bring the ingredients to a simmer. 4. Add the shrimp to the stockpot. Reduce the heat to medium-low and simmer, stirring frequently, for 5 minutes. 5. Once the shrimp are cooked through, remove the pot from the heat. Add the cilantro, salt, and pepper to taste. Squeeze the juice from the limes over the shrimp. 6. Serve over yellow rice or spinach, if desired, with a side of crusty bread to soak up the yummy curry sauce. To cook the spinach, I just added a bit of olive oil to a large frying pan with a bit of minced garlic. Add the spinach, and cook stirring frequently until it is wilted. Spinach cooks down quite a bit, so keep that in mind when determining the amount needed for portion sizes. The shrimp cooking in the yummy curry sauce. If you are looking for a quick and easy summertime dish, this can't be beat! It was delicious. The cookbook is a wonderful combination of Lucy's amazing recipes (the girl starts off with dessert, what's not to love?) and her stories of her adventures throughout the years. I highly recommend picking up a copy of your own. I have already purchased a few as gifts for friends. 1. Preheat oven to 400*F. Lining a baking pan with foil. 2. Place 4-5 pieces of uncured smoked or regular peppered bacon on baking tray. 3. Sprinkle with 1/2 to 3/4 TBS of coconut sugar. Make sure it's evenly distributed on bacon. 4. Bake on bottom rack for 15-18 minutes. 5. Remove from oven. The longer the crispier. You can easily do this in the microwave too if you are short on time. 6. Spoon 1-2 TBS of the bacon juice into a bowl. Let it sit for later use. 7. Once bacon is somewhat cooled, chop it into small pieces. Set aside. 8. Next clean your asparagus and trim bottom stems. 9. Slice your shallot lengthwise. 10. Place the bacon fat in a large skillet on medium heat. 11. Add in your asparagus, shallot, pepper, sea salt, and a little more coconut sugar if desired. 14. Place asparagus in a serving dish and add your candied bacon bits. 15. Spoon any extra juice from the skillet over the asparagus/shallots/bacon. 16. Feel free to add more pepper/lemon/salt here if desired. This was a tasty side that would be perfect with any number of proteins. We chose to serve along beef filets. *original recipe can be found here. Y'all #2 has picked some amazing recipes for us to try this week. Again another quick and easy dish, but full of flavor. As you know, I am a fan of a ONE dish meal. This actually takes two because you boil the lobster separate and need to save the water, but the rest goes in one pan. 4 small lobster tails (6-12 oz each) ***Kroger had the frozen on sale this week. You could sub jumbo lump crab as well. 1. In a large pot, bring 3 cups of water to a rolling boil. Add the lobster tails and let boil very briefly (1-2 minutes) until pink. ***a bit longer if still frozen Turn the heat off. Remove the lobster tails with a pair of tongs. Do not discard the lobster cooking water. When the lobster is cool enough to handle, remove the shell and cut into large chunks. 2. In a large deep pan or skillet, heat 3 TBS olive oil. Turn the heat to medium-high and add the chopped onions. Saute the onions for 2 minutes then add the rice, and cook for 3 more minutes, stirring regularly. Now add the chopped garlic and the lobster cooking water. Stir in the saffron and it's soaking liquid, paprika, cayenne pepper, aleppo pepper, and salt. Stir in the chopped tomatoes and green beans. Bring to a boil and let the liquid slightly reduce, then cover (with lid or tightly with foil) and cook on low heat for 20 minutes. 3. Uncover and spread the shrimp over the rice, pushing it into the rice slightly. Add a little water if needed. Cover and cook another 10-15 minutes until the shrimp turns pink. Finally, add the cooked lobster chunks. When the lobster is warmed through, turn heat off. Garnish with parsley. 4. Serve the paella hot with your favorite white wine. While the original recipe says it serves 4, this makes enough for double that in my opinion. I am back today with what I believe is one of the best dishes we have made in the past few weeks. #2 created the meal plan this week, and I can't wait to share some new to us and to you dishes. I think what truly made this dish was the fact that the tomatoes, jalapeno and basil all came fresh from our backyard garden. Nothing better than homegrown in my opinion. 2. Add the cherry tomatoes and jalapeno and cook, stirring occasionally, until they're soft and blistering, but still hold their shape, about 12 minutes. Add in the vegetable stock, stir, allow the mixture to come to a light simmer. 3. Stir in the basil, lemon juice, lemon zest, salt, and pepper and cook for 2 minutes. Transfer the sauce into a large bowl and set aside for later. 1. Heat oil in the same pan over medium heat. Season both sides of fish with salt and pepper. Place tilapia fillets in the oil and cook until golden brown, about 3 minutes on both sides, until it's cooked through. 2. Pour the tomato basil sauce over the fish and reheat quickly. Serve all at once with additional chopped basil. Y'all the fish is melt in your mouth good. And, the freshness of the homegrown herbs and veggies just elevates this dish even more. Hello, and happy late Monday. I hope everyone had a great weekend. We spent a good bit of it doing yard work. All this rain has created some major drainage problems we are trying to correct. Today I thought I'd share a quick and easy recipe with you. This is a dish that once prepped (the time consuming part) comes together quickly. Cook spaghetti according to directions listed on package. Meanwhile prepare peanut sauce by combining all sauce ingredients in a mixing bowl, whisking until well blended and smooth. I like to prep everything ahead of time as seen below. Drain pasta and pour into a large serving bowl. Toss with sauce then add bell pepper, cucumber, green onions, cilantro and peanuts and toss lightly. Sprinkle with sesame seeds and serve. Super tasty and easy. Enjoy. Hello friends. 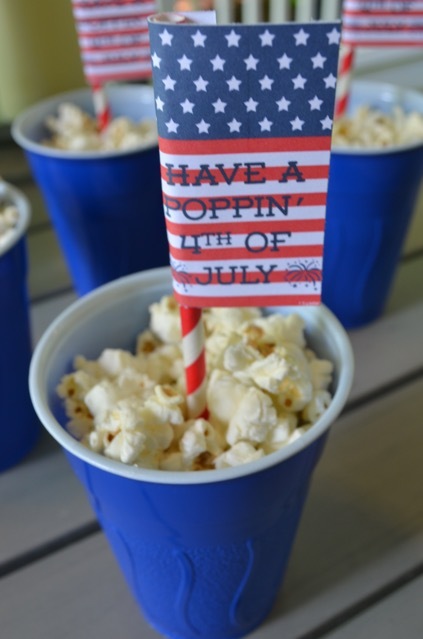 Happy day after 4th of July. I pray everyone had a safe and fun holiday. In typical Atlanta fashion, it rained on and off all day. Boo. But, that didn't stop us from having a little fun on our covered porch. I was recently contacted by the Outreach Coordinator for Skinnypop Popcorn. 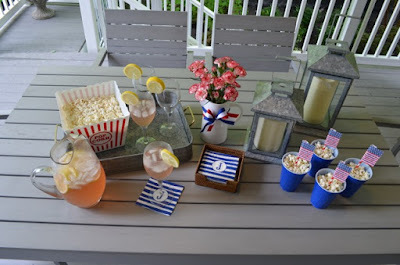 They have put together a great list of cocktail and popcorn pairings to enjoy this summer. Most of you know, we love our popcorn! I couldn't pass up an opportunity to share a brand that we have come to love with my readers. Please note, I am in no way being compensated for this post. All opinions are that of my own. What I love most about the brand is their packaging. When selecting a bag you know exactly what you are getting. No hidden ingredients, nothing I can't pronounce. How fun are these simple pairings? Moscow Mule/Original, Blueberry Mojito/Sea Salt & Pepper, Blackberry Smash/Aged White Cheddar/Dairy Free White Cheddar, White Peach Sangria/Naturally Sweet, Coconut Margarita/ Pepper Jack/Jalapenó. We decided to get a little creative ourselves. We were thrilled to learn that Skinnypop White Cheddar Popcorn is dairy free. And Rosé wine is so hot now. So, why not combine the two? Who doesn't love wine and cheese? The table setting came together quickly with things I already had around the house. 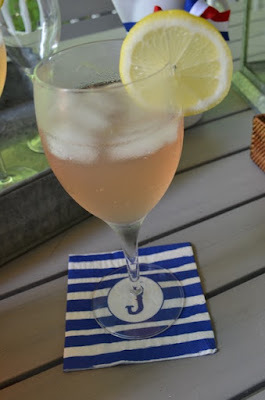 I will share the recipe for the Rosé Lemonade at the end of the post. The perfect cocktail for a hot humid summer day. 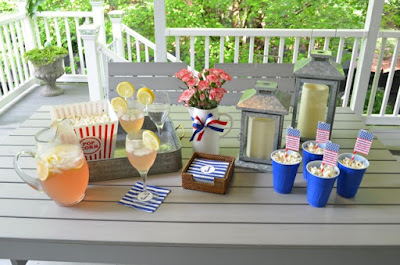 To anchor the table setting I used my galvanized tray and lanterns from Target. For the centerpiece I used a small white pitcher from Home Goods that I tied a bit of red, white and blue ribbon around and filled with inexpensive carnations from Trader Joes. The blue and white J napkins were a gift from a girlfriend. We had blue Solo cups on hand as well as the red and white striped paper straws. My #2 created the "Have a Poppin' 4th of July" flags on her computer for me. We attached them to the straws with a bit of double stick tape. The red and white popcorn bucket is an old Target dollar section find we use for movie nights. My go to glass pitcher and wine glasses finished it off. Y'all we pulled this off in 20 minutes. 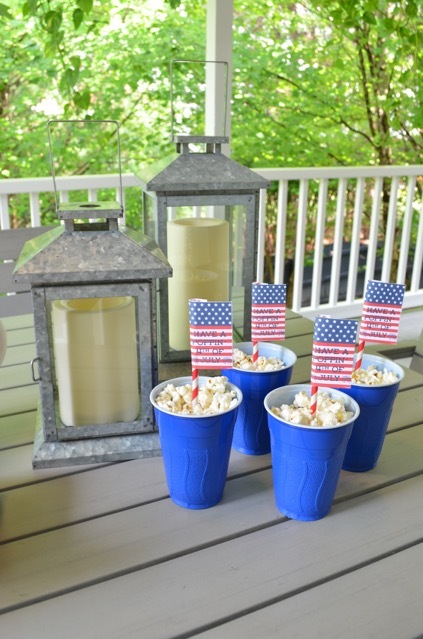 The Solo cups filled with the White Cheddar popcorn are the perfect portion size, and the cute little flags just add a festive touch. This could be done with any number of the colored cups available for a variety of holidays. Think the Naturally Sweet popcorn in red Solo cups with a bit of red, white and pink sprinkles on top. Attach one of those yummy cinnamon gummy hearts to the straws and you've created a fun, sweet treat in no time. I just loved the blush pink color of the Rosé Lemonade. Sliced lemons in the pitcher and on the rim of the glasses just scream summertime. A closer look at the darling flags #2 designed for the occasion. A centerpiece doesn't have to break the bank. 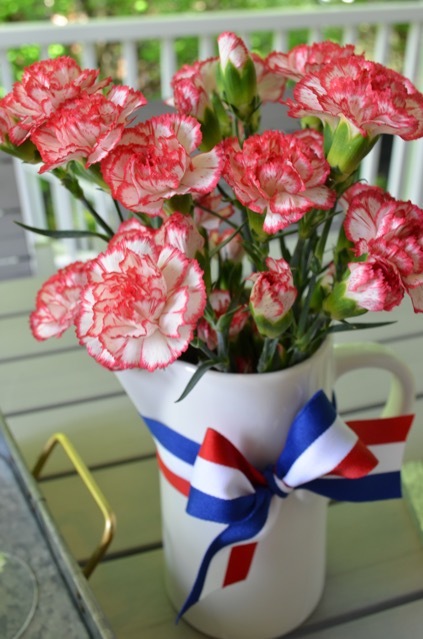 These sweet carnations were under $5, and will last a few weeks. Combine the rosé, lemonade, and lemon slices in a large pitcher filled with ice. Top with club soda. Pour into 8 glasses, adding ice from the pitcher to each glass as needed. 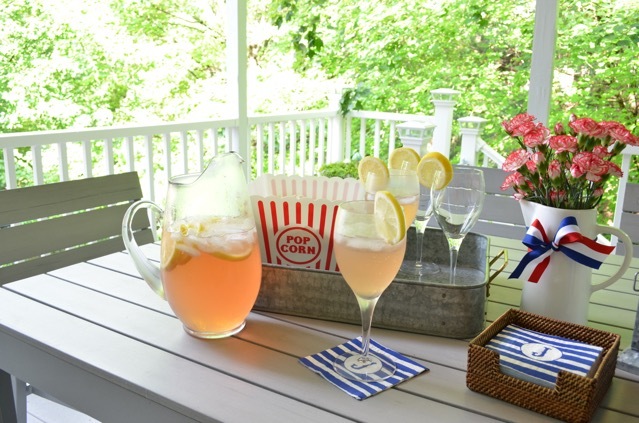 ***This recipe could easily be doubled to fill a drink dispenser making serving a breeze for a larger gathering. I hope this will inspire you to try the many Skinnypop flavors that are available, and maybe create your own cocktail to go with it.